services such as customer service, support and online banking. There is a high demand for security, flexibility and reliability, if functions used on the internet presence shall communicate and exchange information with systems in the company. An integration of the systems thus forms the basis of e-commerce. TRANSCONNECT® supports you in this area. The online offer is usually integrated into the IT landscape of the company. This requires interfaces to the merchandise management system, ERP and CRM. Depending on requirements, additional own or external systems are connected. Without integration tools, a large construct would be created at interfaces, all of which would have to be separately built, maintained, and updated. A largely automated process chain therefore plays a particularly important role in well-functioning e-commerce environments. 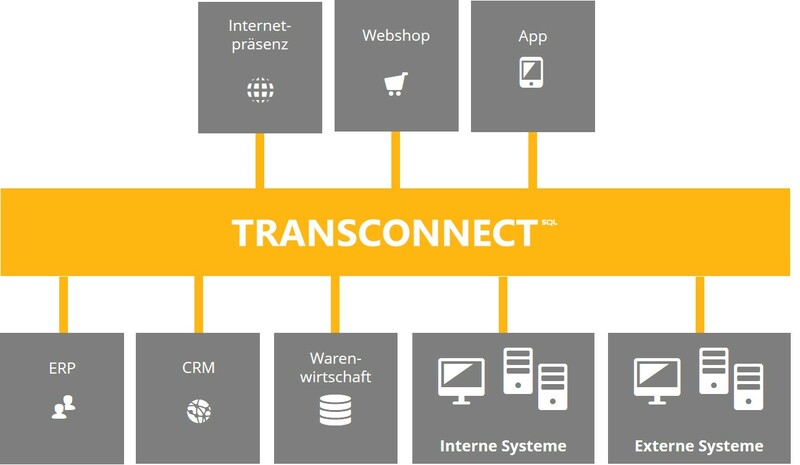 At this point TRANSCONNECT® is used, which is connected as an integration platform between the systems. In addition, it can be determined which information is to flow at what times: This controls which systems need to be called up and recorded just-in-time and which at longer intervals. Easy configurability and reliable operation characterize TRANSCONNECT®, thus laying the foundation for a solid e-commerce system. The security of data and transactions is another advantage. The direct connection of the individual systems and applications directly to TRANSCONNECT® also leads to considerable cost and time savings.